April 17, 2018 | Michele Cohen, Ph.D. Since 1863, Thomas Crawford's marble sculptural group "Progress of Civilization" has stood in the pediment above the Senate doors on the East Front of the Capitol. Its details have always been difficult to see from the ground, but the scaffold erected for the recent stone restoration project allowed curators to examine Crawford's work up close. 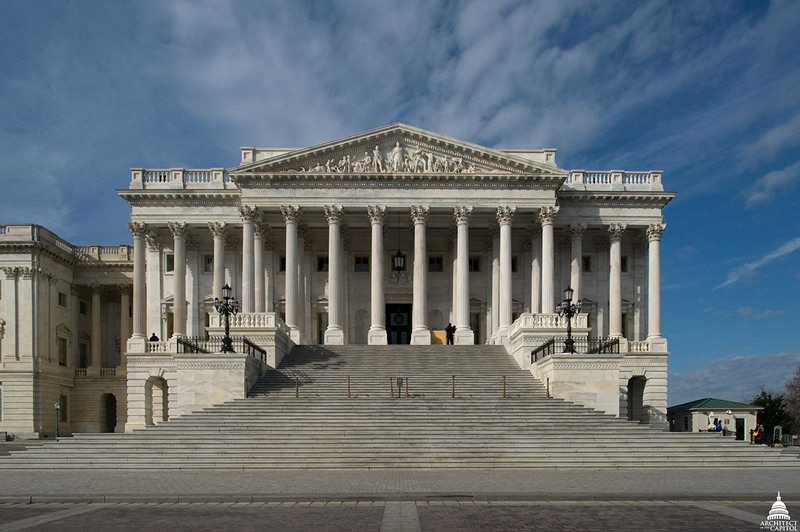 As a result, the Architect of the Capitol (AOC) has made some interesting discoveries about the details of the sculptures. Most interesting among them, the $28,000,000 incised below the figure of the Merchant. View of the Senate wing's pediment, "Progress of Civilization." The AOC's Office of the Curator did some sleuthing and confirmed the significance of the number $28,000,000. It refers to the Treasury surplus in 1853. In a letter of October 31, 1853, that sculptor Thomas Crawford wrote to Captain Montgomery Meigs from Rome, Crawford provided a detailed explanation of the pediment's iconography and argued for federal support of the arts. Meigs had solicited designs from both Crawford and Hiram Powers, and Crawford was concerned that Powers might recommend a less ambitious sculptural program at a lower cost, forcing him to reduce the scope of his own design and/or his fee. This was ultimately not an issue, as Powers declined. After providing a lengthy description of his sculptural group, but before stating his fee, Crawford wrote, "Should Mr. Powers conclude to offer a design covering less space than I have done, I presume I should not be required to reduce my composition to compare with his for any other reason than matters of economy might suggest. The economy of a few thousand dollars contrast with $28,000,000 surplus in the Treasury [when the] dignity of the fine arts and the proper embellishment of our greatest national building are under consideration would certainly produce a result not in accordance with the gigantic prosperity of our country." In other words, the government had plenty of money and shouldn't skimp on funding for the arts, especially for the U.S. Capitol. 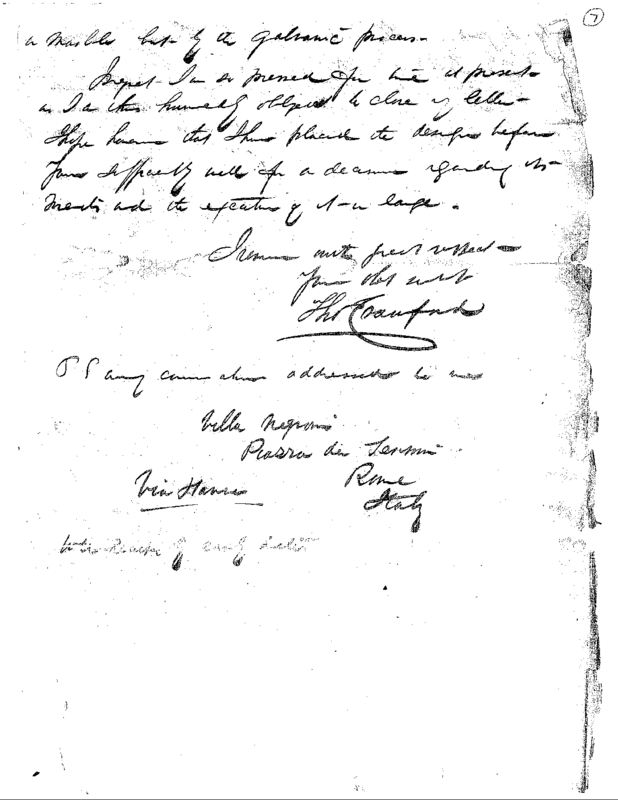 The first and final pages of Crawford's letter. 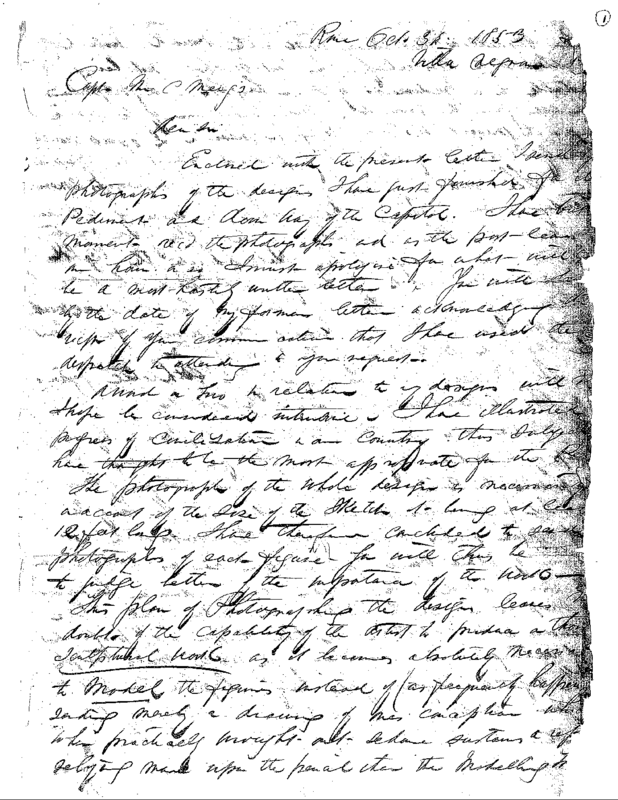 He continued, "I shall therefore hope that the President of the United States will give the whole subject due attention and that the decision may be an example to our future chief [illegible] in calling their attention to the necessity of encouraging the fine arts which undoubtedly are considered a powerful element in the progress of any nation to the highest state of refinement." In making his case, Crawford referenced previous commissions paid to John Trumbull for his four Rotunda paintings (each at a cost of $8,000) and to Luigi Persico and Horatio Greenough for their sculptural groups for the East Front cheek blocks ($24,000 and $28,000, respectively). Until now, this portion of Crawford's letter was not widely known. In his 1964 book, "Thomas Crawford: American Sculptor," Robert Gale quoted excerpts from the 1853 letter, but he did not mention the $28,000,000 Treasury surplus or discuss Crawford's fee negotiation. Gale cited the National Archives as the repository for the letter but did not provide specifics. To locate the original letter, staff at the National Archives searched the records of the Secretary of the Senate for the 33rd Congress. That yielded no results but given Meigs's work with the Army Corps of Engineers and involvement with Secretary of War Jefferson Davis, archivists recommended searching the records of the Secretary of War (RG 107) or the Records of the Office of the Chief of Engineers (RG 77). 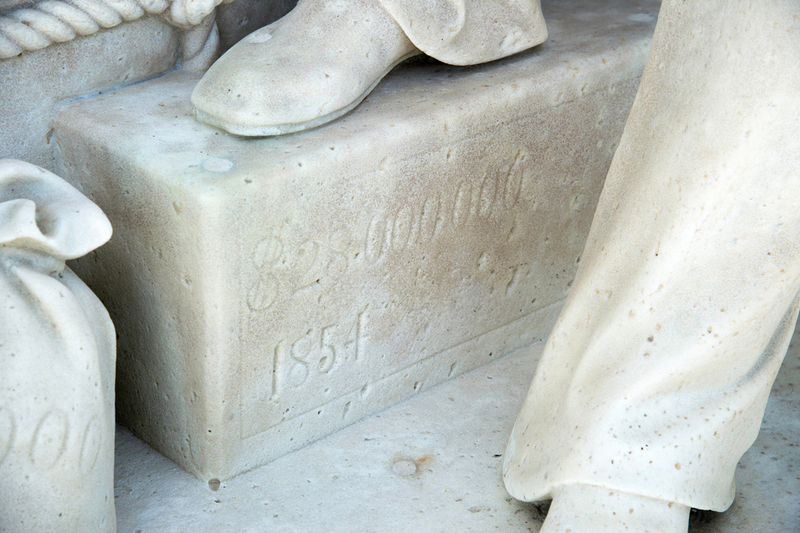 "The Merchant" of the pediment with his right foot on a block inscribed with "$28,000,000." As luck would have it, Archivist John Deeben found this letter in the latter in the textual series "Monthly Reports of Operations and Letters Sent by Capt. M. C. Meigs to the War Department Relating to Work on the Capitol Extension and the Washington Aqueduct, 1853-1858" (entry 276). We now have textual evidence to corroborate our hunch that the figure of the Merchant is likely the Secretary of the Treasury, John Guthrie, literally sitting on a $28,000,000 surplus. Thanks to two members of the Curator's office: Vicky Villano and Eric Paff, as well as, our colleagues at the Library of Congress and National Archives who provided valuable assistance in cracking this case. Michele Cohen is Curator for the Architect of the Capitol. THANK YOU AGAIN FOR ANOTHER HISTORY LESSON ON THE STORY BEHIND WHAT WE CANNOT SEE.